Did you just celebrate Easter or Passover? What do you do with a batch of hardboiled eggs? Hi, I'm Jenna Hart. After leaving the high-powered world of advertising, I've come home to Crystal Cove. My Aunt Vera, who asked me to help her open a culinary bookshop and café, loves to decorate the shop for just about every theme that might be going on in our town. Surfing contests, Frisbee contests, old vintage car rallies. She also adores decorating for Halloween and Christmas. And it doesn't matter what time of the year, she loves dying Easter eggs. We have over two dozen. I’m a foodie, but I’m not quite a cook. Understatement of the year, just so you know. A disastrous soup that almost killed my husband (he was allergic to dill, oops) didn’t help me in the confidence department. But now that I’m running The Cookbook Nook and café, I’m willing to learn. My aunt and my good friend, Katie, the new chef at the Nook Café want me to start by making recipes that have five ingredients or less. They say spices don’t count, so my aunt suggested this deviled egg recipe to use up the dyed Easter eggs. It works for me. I love deviled eggs. So easy and tangy. Perfect for an appetizer or lunch, don’t you think? Enjoy! PS I have to admit that my aunt made the boiled eggs. She gave me all sort of tips about how to make them perfectly, but hot spitting water and me? There's not an oven mitt long enough...yet. Her main tip: Cook the eggs at a full boil and add ice at the end. I'm not sure I can retain all that she told me, though I'm pretty good in the memory department--faces, name, details. I asked for her help in writing down the instructions, just in case. So, see below. Per my Aunt Vera, to boil eggs perfectly…put cold eggs in a saucepan and add cold water to cover. Bring to a boil (takes about 5-7 minutes). Turn to low and simmer-boil for 15 minutes. Remove from heat. Pour off the hot water. Rinse eggs with cool water. Then add a bath of ice water. [This means adding about 4 cups of ice cubes. I can't tell you how thankful I am for an automatic ice maker.] Let the eggs cool completely (about 20 minutes). This is where I start the recipe. Peel eggs. Easy! Cut the eggs in half, lengthwise. Using a spoon, remove the yolks and place the yolks in a small bowl. Fill egg whites with yolk mixture. I like to pile mine high. Garnish with paprika or pickle slices. Store covered in refrigerator. As my aunt loves to say about cooking and life...SAVOR THE MYSTERY. So...what normal chore puts terror in your heart? 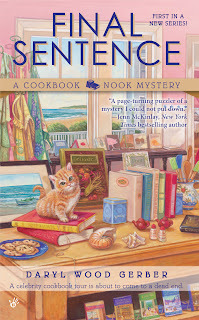 The 1st in A Cookbook Nook Mystery series is coming July 2013!! You can pre-order the book HERE. 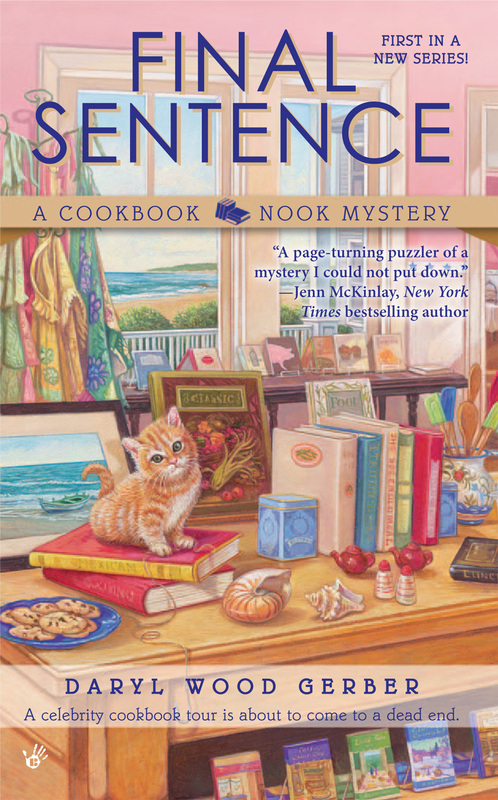 The 4th in A Cheese Shop Mystery series is out! so you can learn about upcoming events, releases, and contests! Also, you probably know by now about my alter ego, Avery Aames. 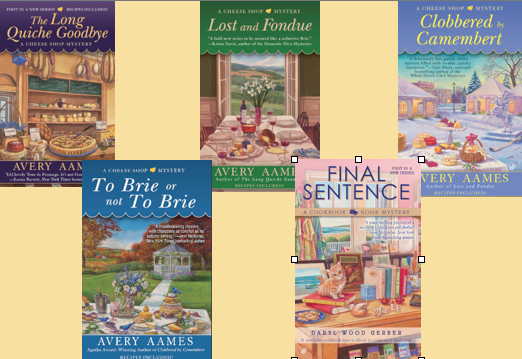 Chat with Avery on Facebook and Twitter. Yummm. I loved deviled eggs too. However, I don't like sweet pickles, I'd switch to dill. Delicious. All chores put terror in my heart. It's probably a cross between the 2 things I hate to do the most, but have to do often-wash the dishes (no automatic dishwasher here) and clean the litter boxes. Katreader...I know what you mean about the dishes. They never seem to go away, right? Yipes. Sue, that's so funny. Hiding dill in the eggs. That's sort of like people that don't like tomatoes but they eat pizza or spaghetti with sauce. Hint (learned from experience): if you put the finished eggs on a flat plate, be careful how you carry them to and from the fridge. Those little deviled eggs have slippery bottoms! Oh, Edna, I snorted when I read this. You're right. I guess that's why there are those egg plates. I always thought they were a silly item to buy, but now I know why! Yes, bathrooms are the worst! I don't mind dishes and laundry, vacuuming is okay. Dusting is a pain. I have never put relish in my deviled eggs, or dill. I think I may have to try both ways. There are plenty of eggs left to do that. Thanks for the ideas! And th ebook sounds so fun! I love deviled eggs but have never attempted making them. In fact, I'm known for taking shortcuts with my meals. Perhaps I can learn, along with you, as your series progresses. Certainly looking forward to it! I love deviled eggs, but I'm the only one who does... so I don't make them that often. I am looking forward to enjoying the new series and I just know it's going to be a major best selling one. NoraA, thanks for chiming in. And I'm so excited all of you are looking forward to my adventures. I am, too. It's all so new to me. Moving home...I adore Crystal Cove. I hope it will love me back. My friend owns some hens and once the weather gets warm, they lay eggs like crazy and I get some of the blessings. I usually parlay hard boiled eggs into potato salads. :) My fave. Love deviled eggs too, though I would pass on the relish. We double up on the good fats and skip the mayo by mixing the yolk with avocado. I don't dig chores of any sort, but man there is something extra annoying about folding laundry. Especially if fitted sheets are involved! Kelly, you add avocado to your eggs and skip mayo? Hmmm. I love avocados. I'll have to try that. Sounds sort of like a club salad. What if we added bacon? Oh, yum. I'm becoming a chef, right? I've always been a gourmet. I only cook them for 4 minutes though, and then let the cold water run for a minute over them. I mash the yolks with some mustard, lots of mayonnaise, some sweet pepper powder, some salt, and a few spoon fuls of cream cheese with chives. Mix it all, and fill the halve eggs with it. I recently decided to decorate them with some bacon crumbles, and that was a big hit. I also roll them in some Parma Ham, which is a delicious combo. I have no measurements to offer, as I just do it by feeling and tasting. It all depends on how many eggs, how big the yolks etc. And to prevent them from sliping of the platter, I use one with standing edges. I do hate all chores, but washing windows is the worst one.